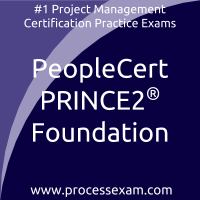 Test your PRINCE2 Foundation knowledge using our PeopleCert PRINCE2 2017 Foundation Certification - Project Management Premium Practice Exam and be assured of your readiness for the PeopleCert PRINCE2 Foundation certification exam. This practice exam validates your learnings with a set of refined and recently updated questions which will improve your subject knowledge and help you identify the areas of improvement. The PeopleCert PRINCE2 Foundation Questions Bank contains 1020+ Questions, our premium PeopleCert PRINCE2 2017 Foundation certification practice exam populates questions randomly from this question bank. All the questions of premium question bank will be easily covered in 4 to 6 practice exam attempts. However the more you practice, the best will be the result in actual PeopleCert PRINCE2 Foundation exam.